The Alps. Everybody's heard of them, everybody has some sort of an image in their head when they hear the word mentioned. Usually that image involves snow, jagged soaring peaks and skiing... but where exactly, are the Alps, and is there more to them than snow and skis? Are the Alpine regions of France places you might consider buying a property, even if you are not a skier? Is it snowy all year round, or does the snow melt... and then what happens? 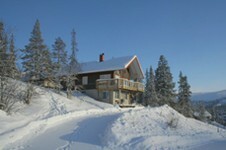 Is property in the Alps prohibitively expensive, or are there areas where you can find somewhere at a reasonable price? If you don't know the Alps well, but think you might be interested in buying a property there, then there are many questions to be answered. Where are the French Alps? The Alps are situated in the far east and south-east of France, where France borders, from north to south, Switzerland and Italy. The French regions that contain them are Provence-Alpes-Côte-d'Azur (Provence-Alpes-Côte d'Azur Property Guide) and the Rhône-Alpes (Rhône-Alpes Property Guide), with the Alps being in three departments in both of these regions. In the Rhône-Alpes, these are the departments of the Haute-Savoie (74 Haute-Savoie Property Guide), Savoie (73 Savoie Property Guide) and Isère (38 Isère Property Guide). In the Provence-Alpes-Cote-d'Azur, these are the departments of the Hautes-Alpes (05 Hautes-Alpes Property Guide), Alpes de Haute Provence (04 Alpes de Haute Provence Property Guide) and Alpes-Maritimes (06 Alpes-Maritimes Property Guide). How can you reach the Alps? Access to the Alps is perhaps not as easy as to some parts of France, but most people consider it well worth it when they arrive (French Connections). Unlike Hannibal, though, you don't have to buy a team of elephants these days (Travel France). Transport routes are improving constantly, and accessing the Alps now is much simpler than it used to be (French Connections - Travel to East France, French connections - Travel to Provence and Côte d'Azur in South-East France). There are many possibilities, including flying, taking the train (including a super fast service all the way from the UK on Eurostar) and driving. Possible destination airports for the Rhône-Alpes include Lyon (Lyon Property Guide), Saint ÉtienneSaint Étienne Property Guide), Grenoble (Grenoble Property Guide) and Geneva, whereas the Provençal Alpes are best accessed from Nice (Nice Property Guide). Where in the Alps should I start looking for property? 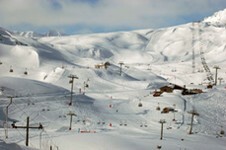 Passionate about skiing - why not try Les Arcs for property? If skiing is of absolute importance, then you could consider the purpose built resorts of Les Arcs (Les Arcs Property Guide), built by Roger Godino and the local boy Robert Blanc, a passionate ski guide and mountain sports expert. Skiing is paramount here, so you may have to sacrifice traditional prettiness of the buildings for excellent access to the best slopes, but many find the trade off well worth while. There are many other activities also around the different areas that make up Les Arcs, and the resorts are well equipped for aprés ski and non snow related sports too, so it could make a perfect place for a holiday home. Amongst the many other possibilities for those of you who dream of waking up to a skiing paradise every day, include the famous resorts of Chamonix (Chamonix Property Guide) and Courchevel (Courchevel Property Guide). These attract the rich and famous, so kit yourself out in your trendiest gear and get ready to party, on and off the slopes! Of course the very hottest of the hot spot resorts also carry the heftiest price tags, so it is important to bear this in mind when deciding where to look. If money is no object... (lucky you!) you really can find some amazing properties in some amazing places in the Alps. You will find some of the priciest properties around Courchevel's highest resort, Courchevel 1850, Chamonix, Val d'Isère (Val d'Isère Property Guide) and the beautiful town of Annecy (Annecy Property Guide). Properties available in the higher price brackets range from state of the art ski chalets, apartments and duplexes... but you will need upwards of €1,000,000 to even begin being taken seriously in Courchevel 1850! In Annecy you could own a fabulous villa, with swimming pool and lake views... if your pockets are deep enough... this will set you back a little over €1,250,000. Sometimes it seems that everyone who owns property in the Alps is a millionaire, and you could be forgiven for feeling despondent at the chances of fulfilling your dream of living in the Alps if you are working on a rather tighter budget. In actual fact, this is not the case at all, and there are numerous places you could consider if you don't have David Beckham's income. Start your search a littler lower down the mountains, and you can find some very affordable properties, even sometimes the elusive renovation project can come onto the market (House Renovations in France), although these don't tend to hang around for long in the Alps, so get your skates on! Take a look at places such as the gorgeous village of La Chapelle d'Abondance (La Chapelle d'Abondance Property Guide) or Taninges in the Haute Savoie (Taninges Property Guide) or perhaps Pralognan la Vanoise in the Savoie (Pralognan la Vanoise Property Guide). Typical budgets (at the time of writing) for one or two bedroomed apartments in ski type chalets in these areas could be around €200,000 - €300,000. Look close to Annecy if you want a major Alpine town with some real character, and if you have a euro or two to spend. Annecy is the last word in romance, with its old fashioned buildings, beautiful lake, its Venetian style waterways and mountain backdrop. If you prefer small and friendly then look to La Chapelle d'Abondance, where you can still see the cows coming down from the high pastures to be milked, and where the houses are little wooden chalets in the best of Savoyard tradition. Then there is the elegant spa town of Evian-les-Bains (Évian-les-Bains Property Guide) where you can take the air and the waters, or perhaps you might prefer the authentic Alpine village of the quaintly named Bozel (Bozel Property Guide). Here there is not only traditional charm, but also some of the most beautiful natural scenery you will ever see... and in this region there is a lot of competition! Dark expanses of pine forests, juxtaposed against the sparkling brilliance of the snow in winter, or offering welcome shade from the powerful sun in summer. And is there a summer in the Alps? Most certainly there is. It's a whole new world up there in the summer months, and if you have only ever associated the Alps with skiing and snow, then you need to experience the summer to believe it. There is still snow on the glaciers and on the high peaks, but in most of the Alps there is the most glorious green world that begins to appear as the blanket of snow recedes in May. A "Heidiesque" landscape appears as if by magic, with lush green pastures, soft eyed cows, the bells around their necks jingling gently as they meander. The mountain lakes are not only picturesque in the summer, they become natural sports centres, with fishermen, swimmers, sailors and windsurfers all taking advantage of the melt, and the strong sunshine that can be found at these altitudes. Summer in the Alps is a time of massive activity for sportsman (Sport in France). Those who love the adrenaline rush of white water sports are drawn as if by a magnet to the wild waters created by the spring melt, and climbers are spoiled for choice by the possibilities once the snow is gone. Walkers (Finding property in the best walking areas of France), horse riders and cyclists (Cycling and motorcycling in France) are in seventh heaven, and surprisingly you can even find golf courses (Property Near Golf Courses in France), quad biking circuits and other less obvious sports available tucked away in the folds of the mountains! If you are less sporty minded and prefer a quiet life, then you too will love the Alps in the summertime. The flora and fauna are unique and abundant, and the perfect peace and clear mountain air are bound to lift and soothe your mind, body and spirit. What's so good about property in the Alps? If you are still wondering what it is about property in the Alps that gets people so excited, then let me try to sum it up for you. In the Alps you can find some of the world's most beautiful and dramatic scenery, and who wouldn't want to wake up to see a Christmas card coming to life outside their bedroom window? It's quite a way to start the day when you throw back your shutters and see the blue of Lake Geneva sparkling in the sunshine, or the shining white peaks of Mont Blanc soaring above you. If you prefer the more prosaic reasons why the Alps are a great place to buy property though, there are plenty. Initially, in comparison with a lot of France, yes, property in the Alps can be expensive. It is, however, always popular, and the Alpine regions are one of the most popular places in France for international property sales. Buy wisely, and it will probably be one of the best investments you could make. Even if you feel that your budget is a little stretched to be able to afford the quality of property and location that you want, it may be possible to offset the costs by renting the property... or part of the property out for part of the year, thus making it more affordable (Letting property in France). The Alps are a superb location for people from all walks of life, and they cater for all interests and all tastes.